Allison's Conclusion — The Contemplative Life. It seems to be en vogue for those in the historical Jesus business to end their reconstruction with a vivid picture which summarizes their position, a la Albert Schweitzer – who ends The Quest of the Historical Jesus with his famous “As One Unknown” quote. I kind of like it. "He does not come to us as one unknown. We know him well enough. 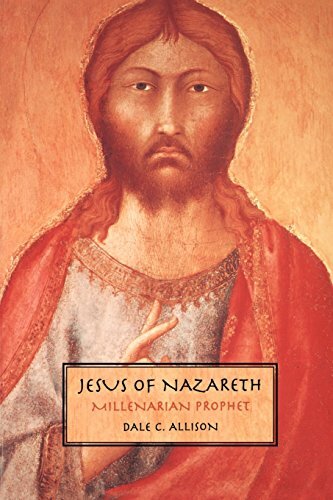 Jesus is the millenarian prophet. He is Wovoka. He is Mambu. He is Birsa. What we think of the least of these, his brethren, we think, to large extent, also of him. Jesus is the millenarian prophet of judgment, the embodiment of the divine discontent that rolls through all things. He sees those who go about in long robes and have the best seats in the synagogues while they lock others out of the kingdom. He sees a rich man clothed in purple and fine linen who feasts sumptuously every day while at his gate is famished Lazarus, whose only friends are the dogs who lick his sores. He sees people who are gorgeously appareled, who live in luxury in royal palaces, and who entertain themselves with the severed head of Elijah come again. What Nietzsche aptly if disparagingly called a "slave morality of chastity, selflessness, and absolute obedience" permits Jesus to see the truth about those who will power instead of justice. They are an evil generation, the blasphemers against the Holy Spirit, the first who will become last. Jesus knows that God promised never again to destroy the world through a flood, but he makes ready for the flood of the end-time anyway. He prepares for the baptism with which he will be baptized. Jesus is the millenarian prophet of consolation and hope who comforts those who mourn. He sees the poor, the hungry, and the reviled, and he proclaims that the last will be first. He makes the best of a bad situation: things are not what they seem to be; everything will be OK. He declares, against all the evidence, that the oppressed and the destitute are not miserable but blessed. They will have treasure in heaven. They will be rewarded at the resurrection of the just. Jesus is the millenarian prophet whose realism is so great that it must abandon the world, the lust of the eyes and the pride of life. He knows that we, being evil, cannot fix things, that the wall cannot climb itself. How bad is it? What is the world really like? God's envoy is reviled as in league with Beelzebul, and the city of the great king kills the prophets and stones those sent to it. Clearly all has gone irredeemably wrong. The kingdom of God suffers violence. But with God all things are possible. So Jesus becomes the visionary, like Daniel. As he watches, thrones are set. He beholds the queen of the South rising from the dead. He sees those who repented at the proclamation of Jonah condemning those who have not repented at the proclamation of one greater than Jonah. Nothing will he hidden. Whatever is covered up will he uncovered. Jesus' generation, however, passed away. They all tasted death. And it is not the kingdom of God that has come but the scoffers who ask, Where is the promise of his coming? For all things continue as they were from the beginning of creation. Jesus the millenarian prophet, like all millenarian prophets, was wrong: reality has taken no notice of his imagination. Was it not all a dream, an unfounded fantasy – a myth, in the derogatory sense of the word? Once, long ago, Christ crucified was foolishness, the great rock of offense. For us, however, crosses are jewelry. Today it is Jesus' status as a millenarian prophet that causes those who believe to stumble. No wonder that the debaters of this age, orthodox and liberal alike, have tried to persuade us that we have troubled ourselves unduly. Jesus, they console us, was no fool about the end. He was no apocalyptic enthusiast. Such apologists for God's envoy either pluck out and cast from the tradition all parts that seem to say otherwise, or they wrongly divide the word of truth in overly clever ways. The result is the same. Whether the misunderstanding is that of his first followers or his latter-day interpreters, Jesus himself is exonerated. When he was near Jerusalem he did not suppose that the kingdom of God was to appear immediately. We can blame the students, who in their eschatological errors have not been like the teacher. But not all was in parables, and maybe Mark was right when he wrote that Jesus explained everything in private to his disciples. Certainly Jesus was not a Delphian obscurantist, nor have the sources obscured him so much from us. He seems to have spoken plainly enough. And what he spoke plainly about was an old world made new, a corrupt world made incorrupt. It has not come. Will it ever? And yet, despite everything, for those who have ears to hear, Jesus, the millenarian herald of judgment and salvation, says the only things worth saying, for his dream is the only one worth dreaming. If our wounds never heal, if the outrageous spectacle of a history filled with cataclysmic sadness is never undone, if there is nothing more for those who were slaughtered in the death camps or for six-year olds devoured by cancer, then let us eat and drink, for tomorrow we die. If in the end there is no good God to calm this sea of troubles, to raise the dead, and to give good news to the poor, then this is indeed a tale told by an idiot, signifying nothing."